Bee-bot Lessons is a resource pack and CD of classroom tested Bee-bot activities and learning resources, licensed for use across the whole school. Bee-Bot Lessons was developed by Cristy McBee, a kindergarten teacher in a technology rich laboratory classroom in Rock Springs, WY. Each of the lessons has been used and refined by both the author and her colleagues throughout the school district. Each is easy to implement and has been tested in the classroom. Bee-Bot Lessons comes with a license to copy the lessons and use them throughout a school site. They work well with students from pre-kindergarten through second grade. Bee-Bot Lessons comes complete with a CD containing nearly 1000 images carefully matched to the lessons, such as the ones to the left that support the lesson on food groups. These brightly-colored images are especially appealing to young children. The images are organized into convenient PDF files. Each lesson specifies the file containing the images that support it, along with other suggested resources, most conveniently available at schools. Print the images, follow the lesson instructions, and set Bee-Bot off on a teaching adventure for your class! With lessons for math, science, social studies, reading, art, and more, Bee-Bot Lessons can be used throughout the day and throughout the year, incorporating technology across the curriculum. The Bee-Bot card mat is the perfect companion for Bee-Bot Lessons. The Bee-Bot card mat is a 6 by 6 grid with a clear plastic sheet on top. The grid is designed so that each square represents one Bee-Bot step. Lift the plastic sheet, place images from Bee-Bot Lessons or those you create on the grid, and lower the plastic sheet to lock them in place. 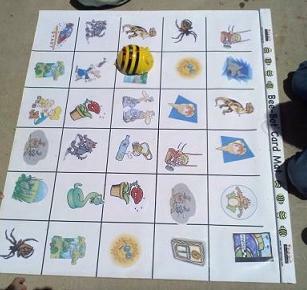 With the grid as a guide, students use Bee-Bot to explore the subject or task represented by the images. The Bee-Bot card mat provides a durable and flexible learning station for Bee-Bot that can be used in all areas of the curriculum.